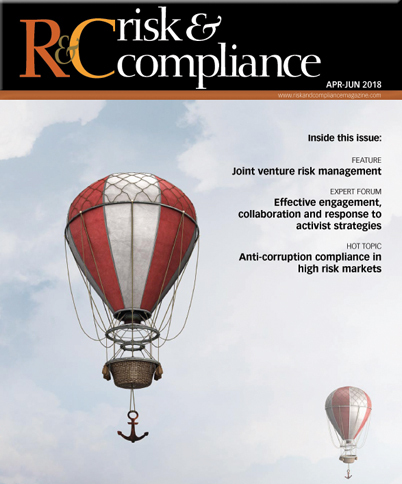 R&C: In your opinion, what factors make the traditional compliance mindset held by organisations a potential liability – or at least a missed opportunity – in today’s risk environment? Delgado: Traditionally, professionals perceive complying with regulations and mitigating the risks of non-compliance as a distraction to running their business. However, organisations should really be integrating compliance initiatives into those already in place to meet their business objectives. Moreover, having a successful compliance programme should be seen more as a positive business differentiator as well as a reputation enhancer. Businesses are increasingly judged on their compliance record and they should make more of an effort to communicate their successes to their clients. And, companies can use their culture of compliance message far more effectively in strategies designed to attract more clients. A world-class record on compliance should set your organisation apart, especially in highly-regulated industries where misdemeanours are high profile, expensive and far too commonplace.